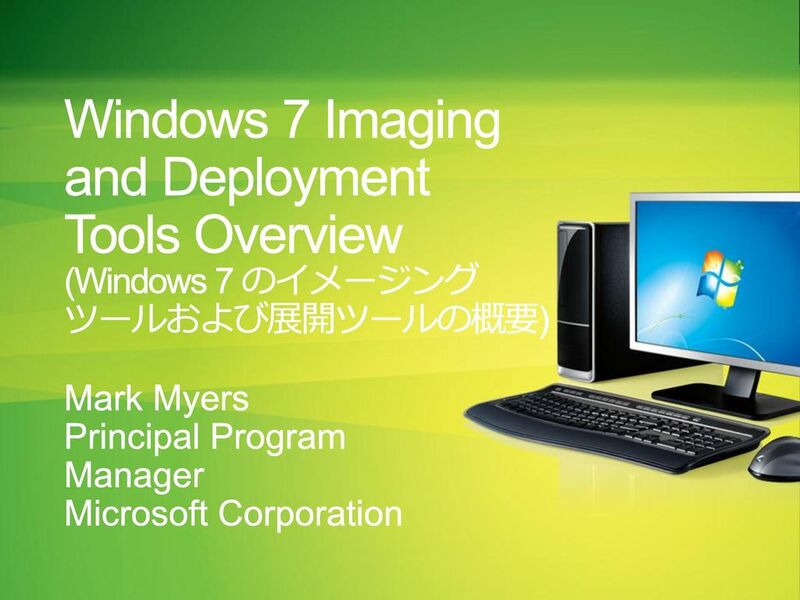 2 Windows Summit 2010 3/1/2017 Windows 7 Imaging and Deployment Tools Overview (Windows 7 のイメージング ツールおよび展開ツールの概要) Mark Myers Principal Program Manager Microsoft Corporation © 2010 Microsoft Corporation. All rights reserved. Microsoft, Windows, Windows Vista and other product names are or may be registered trademarks and/or trademarks in the U.S. and/or other countries. The information herein is for informational purposes only and represents the current view of Microsoft Corporation as of the date of this presentation. Because Microsoft must respond to changing market conditions, it should not be interpreted to be a commitment on the part of Microsoft, and Microsoft cannot guarantee the accuracy of any information provided after the date of this presentation. MICROSOFT MAKES NO WARRANTIES, EXPRESS, IMPLIED OR STATUTORY, AS TO THE INFORMATION IN THIS PRESENTATION. 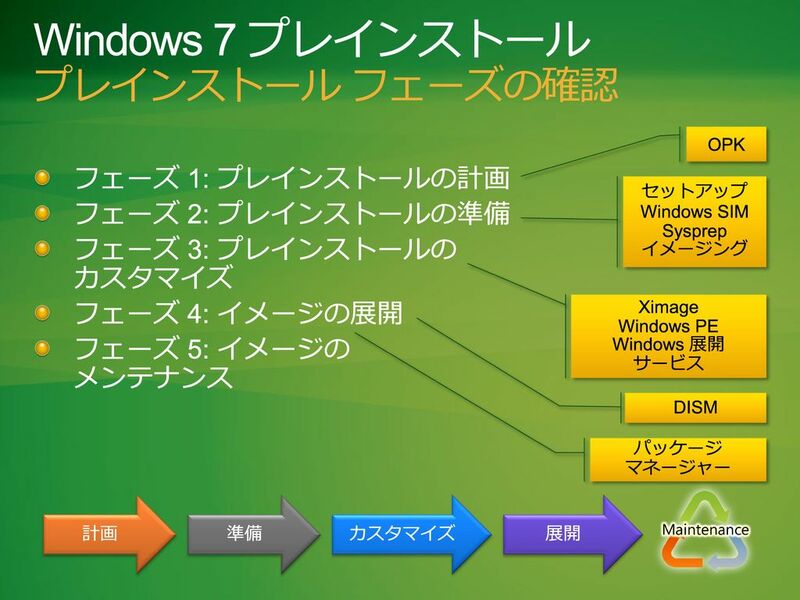 Windows Summit 2010 3/1/2017 議題 Windows® 7の製造戦略 イメージングと展開の新機能 Unattend.xml ファイルの新機能 Windows SIM の新機能 Sysprep の新機能 イメージングの新機能 Windows 展開サービス (WDS) Windows 回復環境 皆様へのお願い リソース © 2010 Microsoft Corporation. All rights reserved. Microsoft, Windows, Windows Vista and other product names are or may be registered trademarks and/or trademarks in the U.S. and/or other countries. The information herein is for informational purposes only and represents the current view of Microsoft Corporation as of the date of this presentation. Because Microsoft must respond to changing market conditions, it should not be interpreted to be a commitment on the part of Microsoft, and Microsoft cannot guarantee the accuracy of any information provided after the date of this presentation. MICROSOFT MAKES NO WARRANTIES, EXPRESS, IMPLIED OR STATUTORY, AS TO THE INFORMATION IN THIS PRESENTATION. 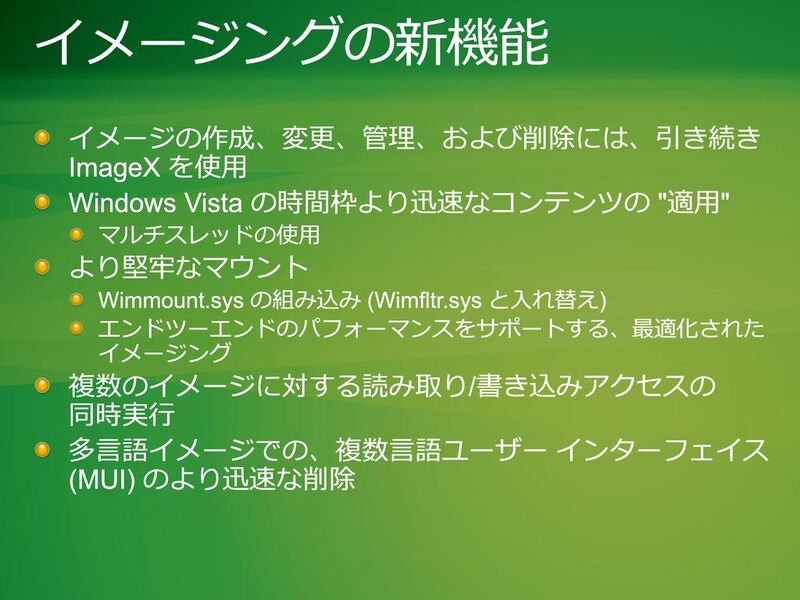 Windows Summit 2010 3/1/2017 Windows 7 の製造戦略 ツールや全体的なプロセスでの大きな変更はなし Windows Vista®からの漸進的な改善 新たなプラットフォームではなく、Windows プレインストール環境 (Windows PE 3.0) の更新 Windows Vista から開始された長期的な投資が 基盤 展開のイメージング、サービス、および 管理 (新たな DISM.exe) イメージングの改善 WDS OOBE (out-of-box experience) の改善 © 2010 Microsoft Corporation. All rights reserved. Microsoft, Windows, Windows Vista and other product names are or may be registered trademarks and/or trademarks in the U.S. and/or other countries. The information herein is for informational purposes only and represents the current view of Microsoft Corporation as of the date of this presentation. Because Microsoft must respond to changing market conditions, it should not be interpreted to be a commitment on the part of Microsoft, and Microsoft cannot guarantee the accuracy of any information provided after the date of this presentation. MICROSOFT MAKES NO WARRANTIES, EXPRESS, IMPLIED OR STATUTORY, AS TO THE INFORMATION IN THIS PRESENTATION. 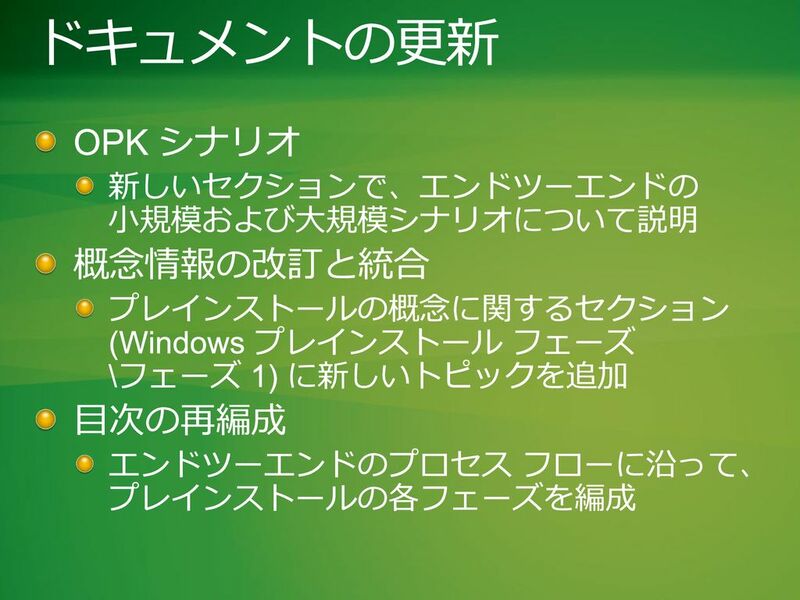 Windows Summit 2010 3/1/2017 Windows 7 プレインストール プレインストール フェーズの確認 OPK フェーズ 1: プレインストールの計画 フェーズ 2: プレインストールの準備 フェーズ 3: プレインストールの カスタマイズ フェーズ 4: イメージの展開 フェーズ 5: イメージの メンテナンス セットアップ Windows SIM Sysprep イメージング Ximage Windows PE Windows 展開 サービス DISM パッケージ マネージャー 計画 準備 カスタマイズ 展開 © 2010 Microsoft Corporation. All rights reserved. Microsoft, Windows, Windows Vista and other product names are or may be registered trademarks and/or trademarks in the U.S. and/or other countries. The information herein is for informational purposes only and represents the current view of Microsoft Corporation as of the date of this presentation. Because Microsoft must respond to changing market conditions, it should not be interpreted to be a commitment on the part of Microsoft, and Microsoft cannot guarantee the accuracy of any information provided after the date of this presentation. MICROSOFT MAKES NO WARRANTIES, EXPRESS, IMPLIED OR STATUTORY, AS TO THE INFORMATION IN THIS PRESENTATION. 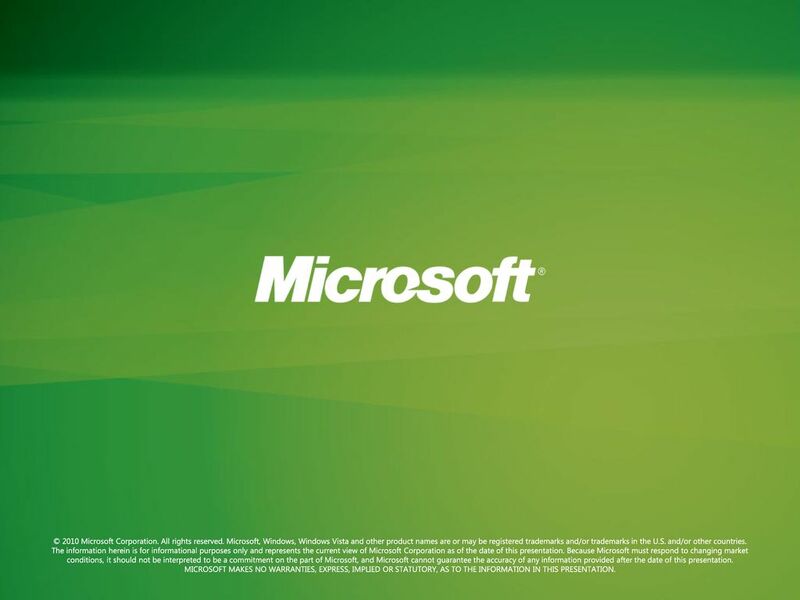 © 2010 Microsoft Corporation. All rights reserved. Microsoft, Windows, Windows Vista and other product names are or may be registered trademarks and/or trademarks in the U.S. and/or other countries. The information herein is for informational purposes only and represents the current view of Microsoft Corporation as of the date of this presentation. Because Microsoft must respond to changing market conditions, it should not be interpreted to be a commitment on the part of Microsoft, and Microsoft cannot guarantee the accuracy of any information provided after the date of this presentation. MICROSOFT MAKES NO WARRANTIES, EXPRESS, IMPLIED OR STATUTORY, AS TO THE INFORMATION IN THIS PRESENTATION. 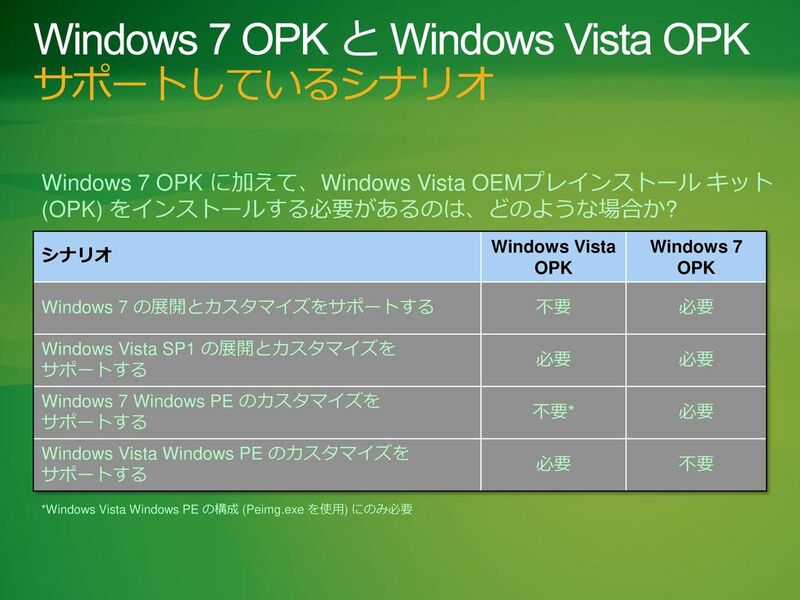 Windows Summit 2010 3/1/2017 Windows 7 OPK と Windows Vista OPK サポートしているシナリオ Windows 7 OPK に加えて、Windows Vista OEMプレインストール キット (OPK) をインストールする必要があるのは、どのような場合か? 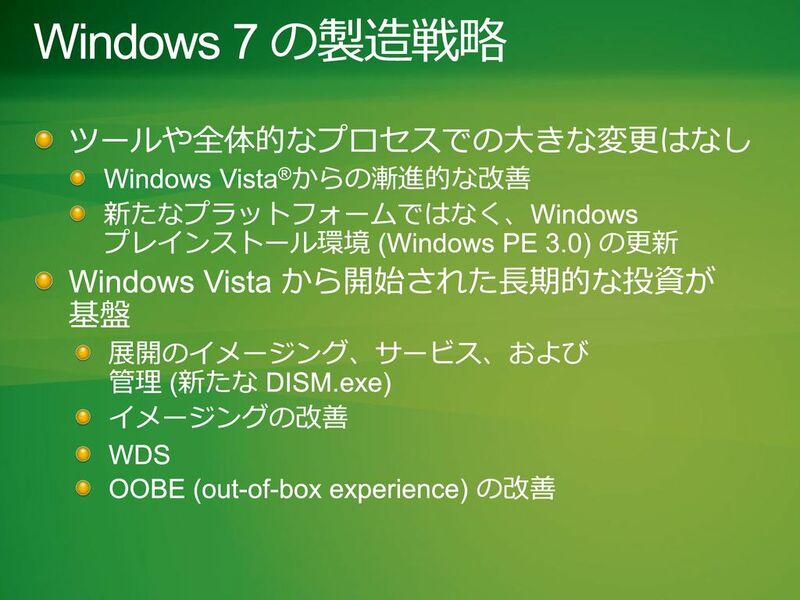 シナリオ Windows Vista OPK Windows 7 OPK Windows 7 の展開とカスタマイズをサポートする 不要 必要 Windows Vista SP1 の展開とカスタマイズを サポートする Windows 7 Windows PE のカスタマイズを サポートする 不要* Windows Vista Windows PE のカスタマイズを サポートする *Windows Vista Windows PE の構成 (Peimg.exe を使用) にのみ必要 © 2010 Microsoft Corporation. All rights reserved. Microsoft, Windows, Windows Vista and other product names are or may be registered trademarks and/or trademarks in the U.S. and/or other countries. The information herein is for informational purposes only and represents the current view of Microsoft Corporation as of the date of this presentation. Because Microsoft must respond to changing market conditions, it should not be interpreted to be a commitment on the part of Microsoft, and Microsoft cannot guarantee the accuracy of any information provided after the date of this presentation. MICROSOFT MAKES NO WARRANTIES, EXPRESS, IMPLIED OR STATUTORY, AS TO THE INFORMATION IN THIS PRESENTATION. 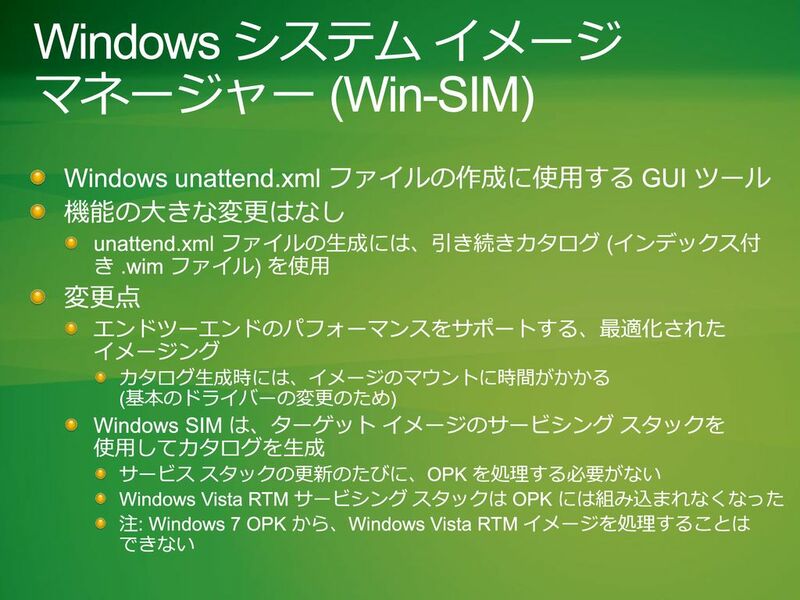 Windows Summit 2010 3/1/2017 OPK のインストール Windows Vista からの大きな変更はなし OPK ツールのインストールが可能なプラット フォーム Windows Server® 2003 SP1 Windows Vista SP1 Windows Server 2008 Windows 7 Windows Server 2008 R2 Windows 7 OPK では、Windows Vista SP1 と Windows 7 の両方の展開をサポート テクニシャン コンピューターには、Windows OPK の 1 インスタンスのみインストール可能 © 2010 Microsoft Corporation. All rights reserved. Microsoft, Windows, Windows Vista and other product names are or may be registered trademarks and/or trademarks in the U.S. and/or other countries. The information herein is for informational purposes only and represents the current view of Microsoft Corporation as of the date of this presentation. Because Microsoft must respond to changing market conditions, it should not be interpreted to be a commitment on the part of Microsoft, and Microsoft cannot guarantee the accuracy of any information provided after the date of this presentation. MICROSOFT MAKES NO WARRANTIES, EXPRESS, IMPLIED OR STATUTORY, AS TO THE INFORMATION IN THIS PRESENTATION. Windows Summit 2010 3/1/2017 ドキュメントの更新 OPK シナリオ 新しいセクションで、エンドツーエンドの 小規模および大規模シナリオについて説明 概念情報の改訂と統合 プレインストールの概念に関するセクション (Windows プレインストール フェーズ \フェーズ 1) に新しいトピックを追加 目次の再編成 エンドツーエンドのプロセス フローに沿って、 プレインストールの各フェーズを編成 © 2010 Microsoft Corporation. All rights reserved. Microsoft, Windows, Windows Vista and other product names are or may be registered trademarks and/or trademarks in the U.S. and/or other countries. The information herein is for informational purposes only and represents the current view of Microsoft Corporation as of the date of this presentation. Because Microsoft must respond to changing market conditions, it should not be interpreted to be a commitment on the part of Microsoft, and Microsoft cannot guarantee the accuracy of any information provided after the date of this presentation. MICROSOFT MAKES NO WARRANTIES, EXPRESS, IMPLIED OR STATUTORY, AS TO THE INFORMATION IN THIS PRESENTATION. 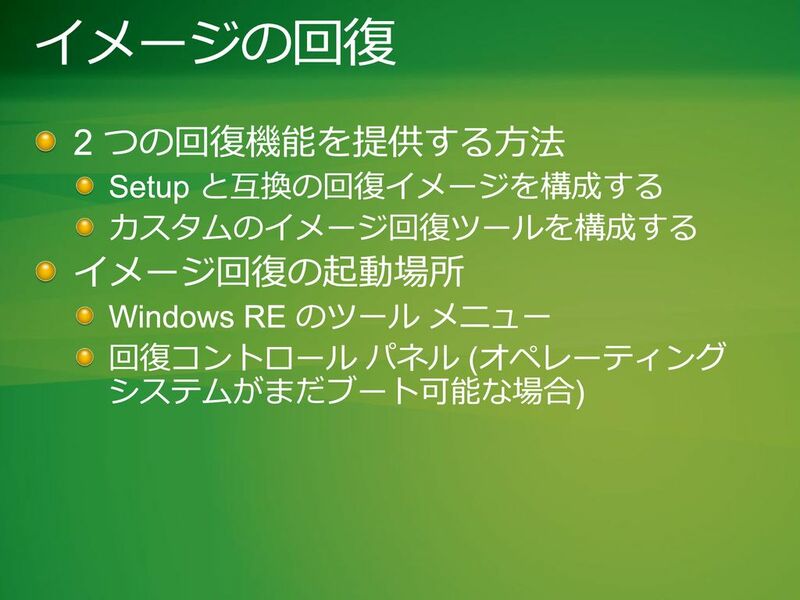 Windows Summit 2010 3/1/2017 Windows の展開: 単一コンピューター © 2010 Microsoft Corporation. All rights reserved. Microsoft, Windows, Windows Vista and other product names are or may be registered trademarks and/or trademarks in the U.S. and/or other countries. The information herein is for informational purposes only and represents the current view of Microsoft Corporation as of the date of this presentation. Because Microsoft must respond to changing market conditions, it should not be interpreted to be a commitment on the part of Microsoft, and Microsoft cannot guarantee the accuracy of any information provided after the date of this presentation. MICROSOFT MAKES NO WARRANTIES, EXPRESS, IMPLIED OR STATUTORY, AS TO THE INFORMATION IN THIS PRESENTATION. Windows Summit 2010 3/1/2017 Unattend.xml の新たな展開設定 Windows の展開を容易化する 2 つの新しい設定 シェルおよび OOBE のカスタマイズ オプション 詳細については、OPK.chm の「Windows 無人セット アップ リファレンス」を参照 Windows 7 の設定 説明 Microsoft-Windows-Deployment/Generalize 監査モードから、OOBE にブートすることなく generalize 構成パスを実行できる Microsoft-Windows-Setup/DiskConfiguration /Disk/ModifyPartitions/ModifyPartition/TypeID BIOS ベースと UEFI ベースの両方のシステムについて、パーティションの種類の設定が可能 © 2010 Microsoft Corporation. All rights reserved. Microsoft, Windows, Windows Vista and other product names are or may be registered trademarks and/or trademarks in the U.S. and/or other countries. The information herein is for informational purposes only and represents the current view of Microsoft Corporation as of the date of this presentation. Because Microsoft must respond to changing market conditions, it should not be interpreted to be a commitment on the part of Microsoft, and Microsoft cannot guarantee the accuracy of any information provided after the date of this presentation. MICROSOFT MAKES NO WARRANTIES, EXPRESS, IMPLIED OR STATUTORY, AS TO THE INFORMATION IN THIS PRESENTATION. 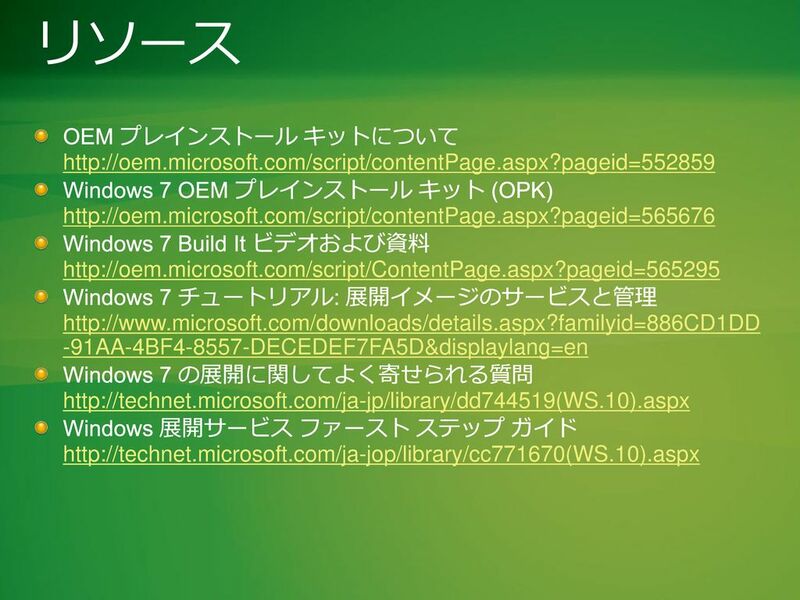 Windows Summit 2010 3/1/2017 Windows システム イメージ マネージャー (Win-SIM) Windows unattend.xml ファイルの作成に使用する GUI ツール 機能の大きな変更はなし unattend.xml ファイルの生成には、引き続きカタログ (インデックス付 き .wim ファイル) を使用 変更点 エンドツーエンドのパフォーマンスをサポートする、最適化された イメージング カタログ生成時には、イメージのマウントに時間がかかる (基本のドライバーの変更のため) Windows SIM は、ターゲット イメージのサービシング スタックを 使用してカタログを生成 サービス スタックの更新のたびに、OPK を処理する必要がない Windows Vista RTM サービシング スタックは OPK には組み込まれなくなった 注: Windows 7 OPK から、Windows Vista RTM イメージを処理することは できない © 2010 Microsoft Corporation. All rights reserved. Microsoft, Windows, Windows Vista and other product names are or may be registered trademarks and/or trademarks in the U.S. and/or other countries. The information herein is for informational purposes only and represents the current view of Microsoft Corporation as of the date of this presentation. Because Microsoft must respond to changing market conditions, it should not be interpreted to be a commitment on the part of Microsoft, and Microsoft cannot guarantee the accuracy of any information provided after the date of this presentation. MICROSOFT MAKES NO WARRANTIES, EXPRESS, IMPLIED OR STATUTORY, AS TO THE INFORMATION IN THIS PRESENTATION. 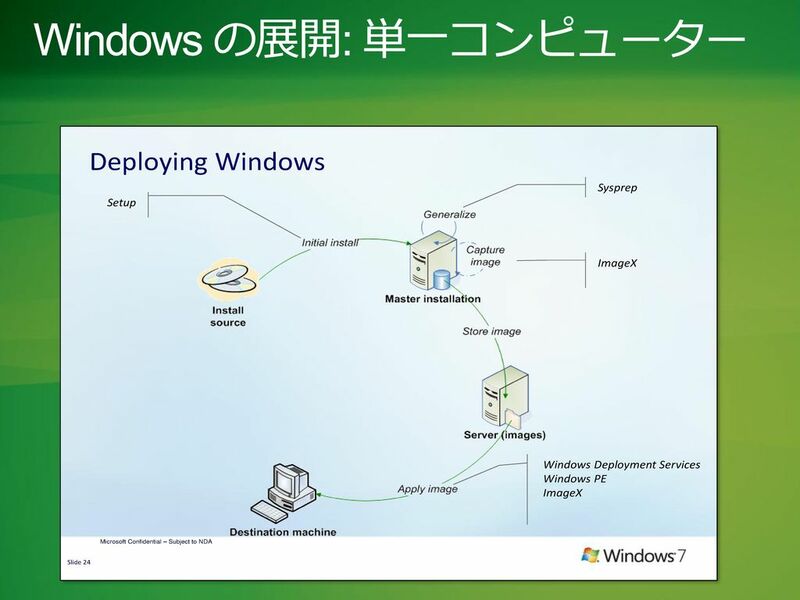 Windows Summit 2010 3/1/2017 イメージングの新機能 イメージの作成、変更、管理、および削除には、引き続き ImageX を使用 Windows Vista の時間枠より迅速なコンテンツの "適用" マルチスレッドの使用 より堅牢なマウント Wimmount.sys の組み込み (Wimfltr.sys と入れ替え) エンドツーエンドのパフォーマンスをサポートする、最適化された イメージング 複数のイメージに対する読み取り/書き込みアクセスの 同時実行 多言語イメージでの、複数言語ユーザー インターフェイス (MUI) のより迅速な削除 © 2010 Microsoft Corporation. All rights reserved. Microsoft, Windows, Windows Vista and other product names are or may be registered trademarks and/or trademarks in the U.S. and/or other countries. The information herein is for informational purposes only and represents the current view of Microsoft Corporation as of the date of this presentation. Because Microsoft must respond to changing market conditions, it should not be interpreted to be a commitment on the part of Microsoft, and Microsoft cannot guarantee the accuracy of any information provided after the date of this presentation. MICROSOFT MAKES NO WARRANTIES, EXPRESS, IMPLIED OR STATUTORY, AS TO THE INFORMATION IN THIS PRESENTATION. 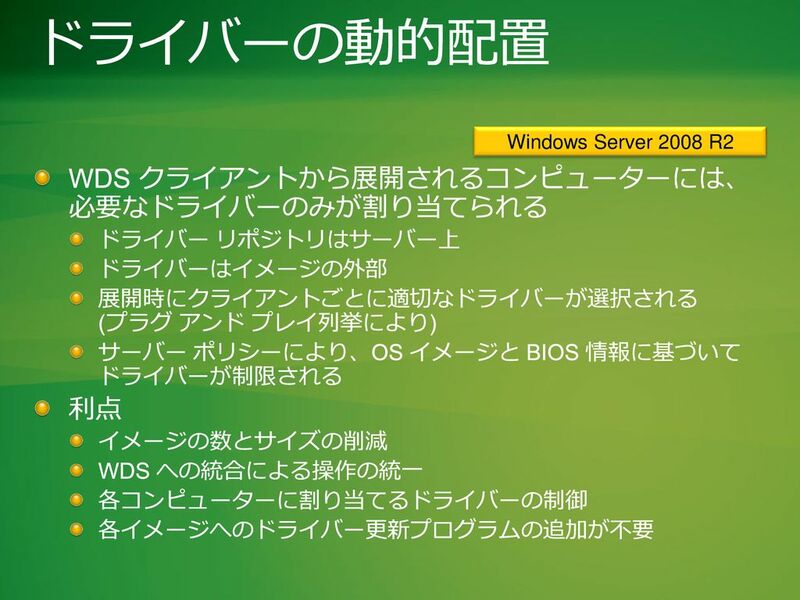 15 Windows Summit 2010 3/1/2017 Windows 展開サービスとは Windows 展開サービス (WDS) は、 Windows Server 2008 R2 のイメージ 展開機能の 1 つ WDS を使用することで、ネットワークへの Windows オペレーティング システムの展開が可能 メディアは不要 無人展開が可能 単一インスタンス記憶域をサポート Pre-boot eXecution Environment (PXE) を活用 © 2010 Microsoft Corporation. All rights reserved. Microsoft, Windows, Windows Vista and other product names are or may be registered trademarks and/or trademarks in the U.S. and/or other countries. The information herein is for informational purposes only and represents the current view of Microsoft Corporation as of the date of this presentation. Because Microsoft must respond to changing market conditions, it should not be interpreted to be a commitment on the part of Microsoft, and Microsoft cannot guarantee the accuracy of any information provided after the date of this presentation. MICROSOFT MAKES NO WARRANTIES, EXPRESS, IMPLIED OR STATUTORY, AS TO THE INFORMATION IN THIS PRESENTATION. 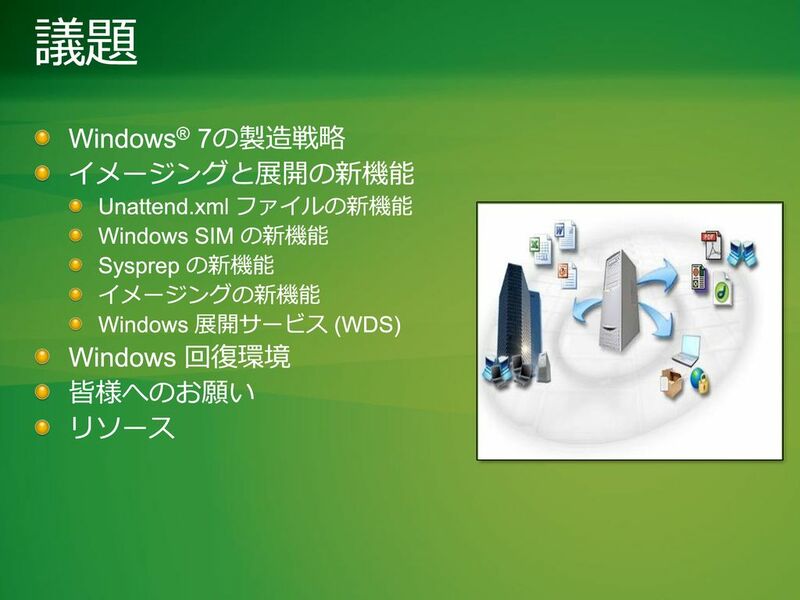 Windows Summit 2010 3/1/2017 WDS の新機能 WDS クライアントの使用による、動的ドライバー プロビ ジョニング ターゲット コンピューターのハードウェアに基づいて、 ドライバー パッケージをターゲット コンピューターに展開 マルチキャスト転送の改善によるイメージ展開時間の短縮 低速クライアントに対する自動的な接続解除 速度の異なる複数のストリームを使用した転送が可能 UEFI ベースのクライアント PC に対する、マルチキャストによる ブート イメージの展開 Active Directory® を必要としないトランスポート サーバーの役割 サービスに対する PXE プロバイダーを含む © 2010 Microsoft Corporation. All rights reserved. Microsoft, Windows, Windows Vista and other product names are or may be registered trademarks and/or trademarks in the U.S. and/or other countries. The information herein is for informational purposes only and represents the current view of Microsoft Corporation as of the date of this presentation. Because Microsoft must respond to changing market conditions, it should not be interpreted to be a commitment on the part of Microsoft, and Microsoft cannot guarantee the accuracy of any information provided after the date of this presentation. MICROSOFT MAKES NO WARRANTIES, EXPRESS, IMPLIED OR STATUTORY, AS TO THE INFORMATION IN THIS PRESENTATION. Windows Summit 2010 3/1/2017 マルチキャストのサポートと使用法 Windows Server 2008 R2 クライアントごとにデータを送るのではなく、1 回だけデータ を送信 すべてのクライアントが同じデータを受信 利点 速度 ネットワーク使用率の削減 – 単一クライアントの場合と同じ ダウンロード数 (クライアント数 50 以上) 100 MB/秒 の LAN の場合、データ転送速度は 10 MB/秒 (ネットブック) 1 Gb/秒 の LAN の場合、データ転送速度は 100 MB/秒 (その他すべて) 25 クライアント 50 クライアント 75 クライアント 250 クライアント SMB 時間 29:25 43:16 57:16 2:38:26 マルチキャスト時間 29:59 32:57 36:44 56:45 © 2010 Microsoft Corporation. All rights reserved. Microsoft, Windows, Windows Vista and other product names are or may be registered trademarks and/or trademarks in the U.S. and/or other countries. The information herein is for informational purposes only and represents the current view of Microsoft Corporation as of the date of this presentation. Because Microsoft must respond to changing market conditions, it should not be interpreted to be a commitment on the part of Microsoft, and Microsoft cannot guarantee the accuracy of any information provided after the date of this presentation. MICROSOFT MAKES NO WARRANTIES, EXPRESS, IMPLIED OR STATUTORY, AS TO THE INFORMATION IN THIS PRESENTATION. 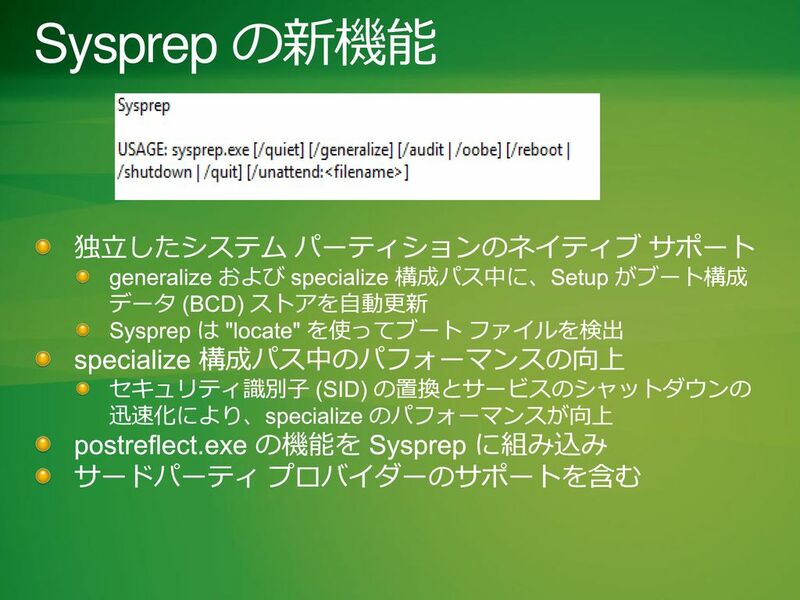 Windows Summit 2010 3/1/2017 マルチ ストリーム転送 Windows Server 2008 R2 マルチキャスト クライアントを "ストリーム" 別 (高速、中速、低速) に分割 利点 高速クライアントで展開を迅速に完了させることが できる 低速クライアントで信頼性のある確実な展開を実行 できる 個々のクライアント ストリームでの帯域幅の使用過多 を防止できる © 2010 Microsoft Corporation. All rights reserved. Microsoft, Windows, Windows Vista and other product names are or may be registered trademarks and/or trademarks in the U.S. and/or other countries. The information herein is for informational purposes only and represents the current view of Microsoft Corporation as of the date of this presentation. Because Microsoft must respond to changing market conditions, it should not be interpreted to be a commitment on the part of Microsoft, and Microsoft cannot guarantee the accuracy of any information provided after the date of this presentation. MICROSOFT MAKES NO WARRANTIES, EXPRESS, IMPLIED OR STATUTORY, AS TO THE INFORMATION IN THIS PRESENTATION. 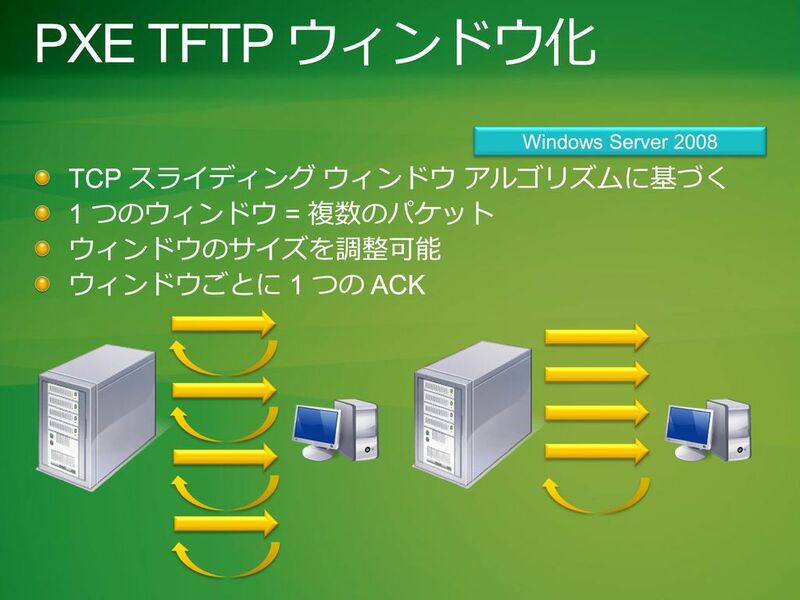 Windows Summit 2010 3/1/2017 PXE TFTP ウィンドウ化 Windows Server 2008 TCP スライディング ウィンドウ アルゴリズムに基づく 1 つのウィンドウ = 複数のパケット ウィンドウのサイズを調整可能 ウィンドウごとに 1 つの ACK © 2010 Microsoft Corporation. All rights reserved. Microsoft, Windows, Windows Vista and other product names are or may be registered trademarks and/or trademarks in the U.S. and/or other countries. The information herein is for informational purposes only and represents the current view of Microsoft Corporation as of the date of this presentation. Because Microsoft must respond to changing market conditions, it should not be interpreted to be a commitment on the part of Microsoft, and Microsoft cannot guarantee the accuracy of any information provided after the date of this presentation. MICROSOFT MAKES NO WARRANTIES, EXPRESS, IMPLIED OR STATUTORY, AS TO THE INFORMATION IN THIS PRESENTATION. 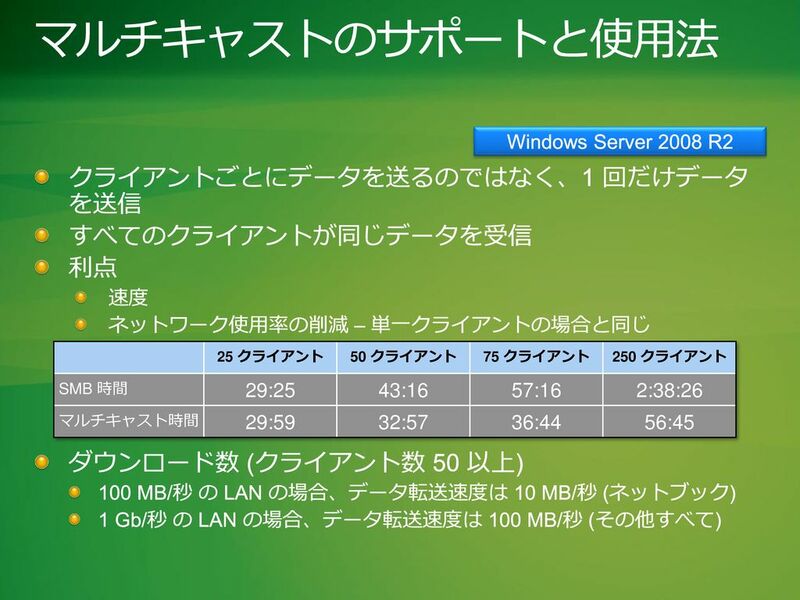 Windows Summit 2010 3/1/2017 ドライバーの動的配置 Windows Server 2008 R2 WDS クライアントから展開されるコンピューターには、 必要なドライバーのみが割り当てられる ドライバー リポジトリはサーバー上 ドライバーはイメージの外部 展開時にクライアントごとに適切なドライバーが選択される (プラグ アンド プレイ列挙により) サーバー ポリシーにより、OS イメージと BIOS 情報に基づいて ドライバーが制限される 利点 イメージの数とサイズの削減 WDS への統合による操作の統一 各コンピューターに割り当てるドライバーの制御 各イメージへのドライバー更新プログラムの追加が不要 © 2010 Microsoft Corporation. All rights reserved. Microsoft, Windows, Windows Vista and other product names are or may be registered trademarks and/or trademarks in the U.S. and/or other countries. The information herein is for informational purposes only and represents the current view of Microsoft Corporation as of the date of this presentation. Because Microsoft must respond to changing market conditions, it should not be interpreted to be a commitment on the part of Microsoft, and Microsoft cannot guarantee the accuracy of any information provided after the date of this presentation. MICROSOFT MAKES NO WARRANTIES, EXPRESS, IMPLIED OR STATUTORY, AS TO THE INFORMATION IN THIS PRESENTATION. 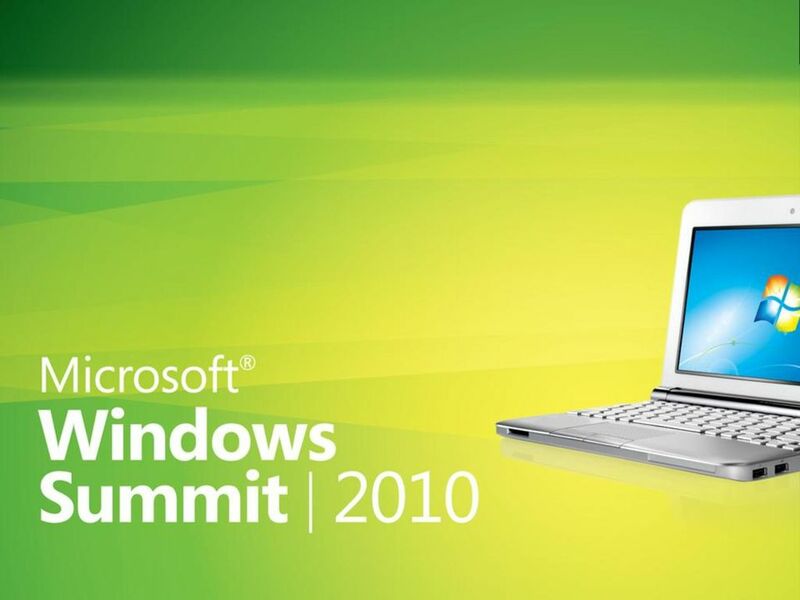 Windows Summit 2010 3/1/2017 新機能: その他のツールと改善点 DISM デバイス ドライバー、言語パック、機能の有効化/無効化、および 更新プログラムの適用による Windows イメージの変更 一部のツールの入れ替え パッケージ マネージャー (Pkgmgr.exe) インターナショナル設定構成ツール (Intlcfg.exe) Windows PE コマンドライン ツール (Peimg.exe) 回復 新たな Windows 回復環境 (Windows RE) を使用した、回復技術の カスタマイズと展開のための拡張ツールセット BCDBoot.exe マルチパーティション展開用の簡素化されたワンステップ ブート構成 Setup ログの改善 イベント ビューアーでパフォーマンス データを参照可能 OEM System Analyzer (OSA) – 最初のユーザー エクスペリエンスでの パフォーマンスの問題の診断を支援 © 2010 Microsoft Corporation. All rights reserved. Microsoft, Windows, Windows Vista and other product names are or may be registered trademarks and/or trademarks in the U.S. and/or other countries. The information herein is for informational purposes only and represents the current view of Microsoft Corporation as of the date of this presentation. Because Microsoft must respond to changing market conditions, it should not be interpreted to be a commitment on the part of Microsoft, and Microsoft cannot guarantee the accuracy of any information provided after the date of this presentation. MICROSOFT MAKES NO WARRANTIES, EXPRESS, IMPLIED OR STATUTORY, AS TO THE INFORMATION IN THIS PRESENTATION. Windows Summit 2010 3/1/2017 Windows 回復環境 (Windows RE) の概要 © 2010 Microsoft Corporation. All rights reserved. Microsoft, Windows, Windows Vista and other product names are or may be registered trademarks and/or trademarks in the U.S. and/or other countries. The information herein is for informational purposes only and represents the current view of Microsoft Corporation as of the date of this presentation. Because Microsoft must respond to changing market conditions, it should not be interpreted to be a commitment on the part of Microsoft, and Microsoft cannot guarantee the accuracy of any information provided after the date of this presentation. MICROSOFT MAKES NO WARRANTIES, EXPRESS, IMPLIED OR STATUTORY, AS TO THE INFORMATION IN THIS PRESENTATION. 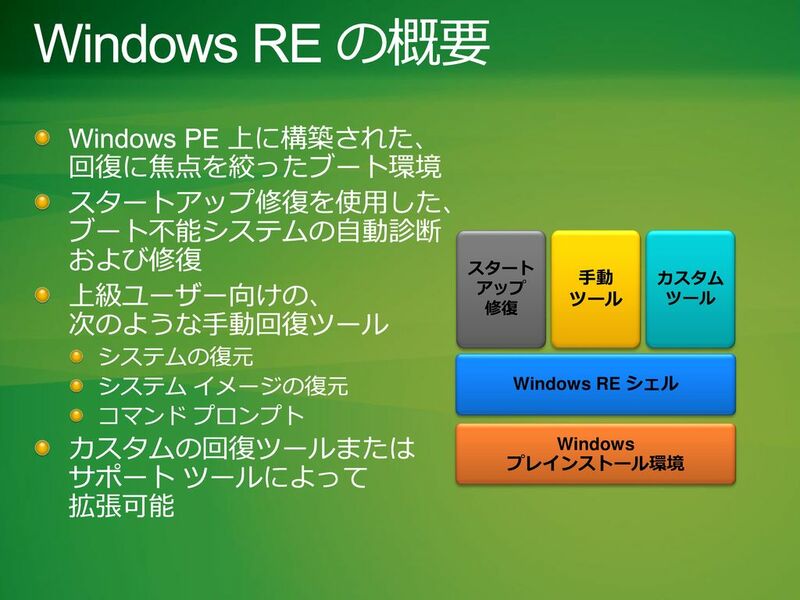 Windows Summit 2010 3/1/2017 Windows RE の概要 Windows PE 上に構築された、 回復に焦点を絞ったブート環境 スタートアップ修復を使用した、 ブート不能システムの自動診断 および修復 上級ユーザー向けの、 次のような手動回復ツール システムの復元 システム イメージの復元 コマンド プロンプト カスタムの回復ツールまたは サポート ツールによって 拡張可能 Windows RE シェル スタート アップ 修復 手動 ツール カスタム ツール Windows プレインストール環境 © 2010 Microsoft Corporation. All rights reserved. Microsoft, Windows, Windows Vista and other product names are or may be registered trademarks and/or trademarks in the U.S. and/or other countries. The information herein is for informational purposes only and represents the current view of Microsoft Corporation as of the date of this presentation. Because Microsoft must respond to changing market conditions, it should not be interpreted to be a commitment on the part of Microsoft, and Microsoft cannot guarantee the accuracy of any information provided after the date of this presentation. MICROSOFT MAKES NO WARRANTIES, EXPRESS, IMPLIED OR STATUTORY, AS TO THE INFORMATION IN THIS PRESENTATION. 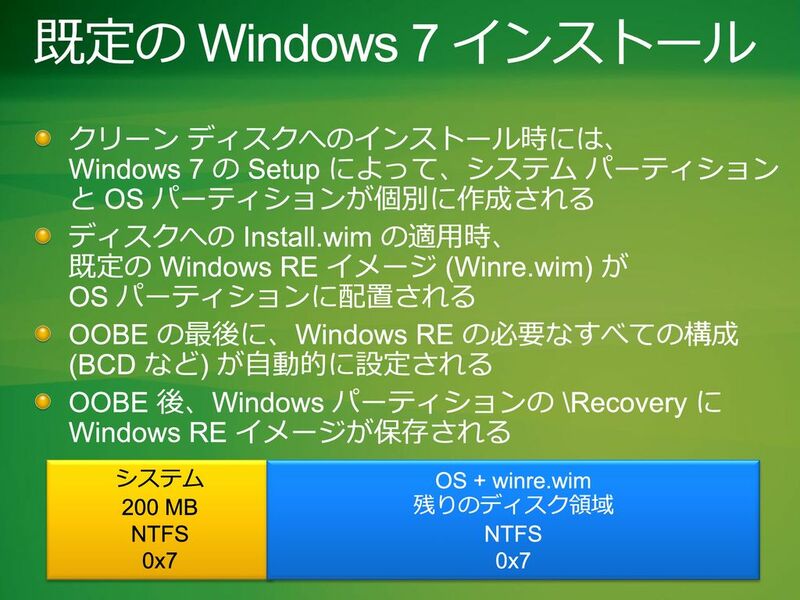 25 Windows Summit 2010 3/1/2017 既定の Windows 7 インストール クリーン ディスクへのインストール時には、 Windows 7 の Setup によって、システム パーティション と OS パーティションが個別に作成される ディスクへの Install.wim の適用時、 既定の Windows RE イメージ (Winre.wim) が OS パーティションに配置される OOBE の最後に、Windows RE の必要なすべての構成 (BCD など) が自動的に設定される OOBE 後、Windows パーティションの \Recovery に Windows RE イメージが保存される システム 200 MB NTFS 0x7 OS + winre.wim 残りのディスク領域 NTFS 0x7 © 2010 Microsoft Corporation. All rights reserved. Microsoft, Windows, Windows Vista and other product names are or may be registered trademarks and/or trademarks in the U.S. and/or other countries. The information herein is for informational purposes only and represents the current view of Microsoft Corporation as of the date of this presentation. Because Microsoft must respond to changing market conditions, it should not be interpreted to be a commitment on the part of Microsoft, and Microsoft cannot guarantee the accuracy of any information provided after the date of this presentation. MICROSOFT MAKES NO WARRANTIES, EXPRESS, IMPLIED OR STATUTORY, AS TO THE INFORMATION IN THIS PRESENTATION. 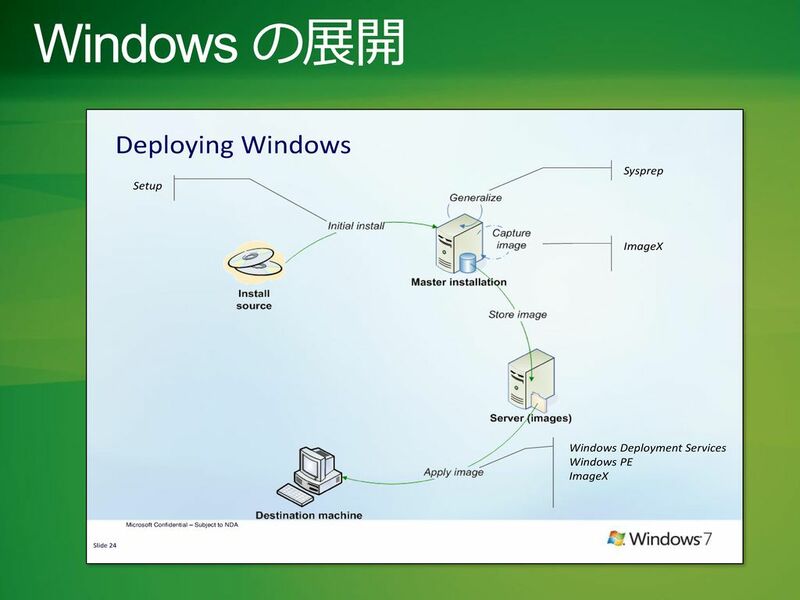 Windows Summit 2010 3/1/2017 イメージの回復 2 つの回復機能を提供する方法 Setup と互換の回復イメージを構成する カスタムのイメージ回復ツールを構成する イメージ回復の起動場所 Windows RE のツール メニュー 回復コントロール パネル (オペレーティング システムがまだブート可能な場合) © 2010 Microsoft Corporation. All rights reserved. Microsoft, Windows, Windows Vista and other product names are or may be registered trademarks and/or trademarks in the U.S. and/or other countries. The information herein is for informational purposes only and represents the current view of Microsoft Corporation as of the date of this presentation. Because Microsoft must respond to changing market conditions, it should not be interpreted to be a commitment on the part of Microsoft, and Microsoft cannot guarantee the accuracy of any information provided after the date of this presentation. MICROSOFT MAKES NO WARRANTIES, EXPRESS, IMPLIED OR STATUTORY, AS TO THE INFORMATION IN THIS PRESENTATION. 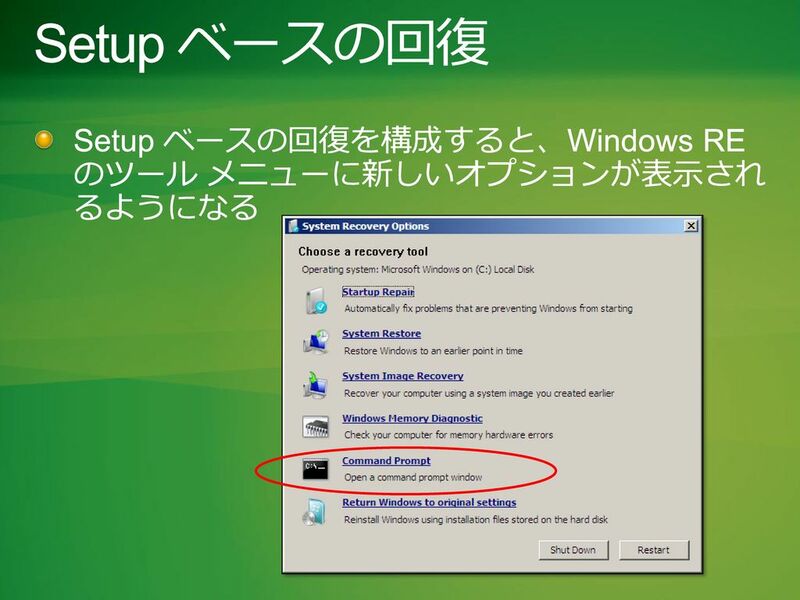 Windows Summit 2010 3/1/2017 Setup ベースの回復 最小限の構成でクイック再インストールのメカニズムを 提供 機能 製造時にハード ディスクに回復イメージを配置する Windows RE によって、現在インストールされているオペレー ティング システムからシステム言語、インストールの場所、 およびプロダクト キーが抽出される Windows RE によって、応答ファイルが生成され、Setup が 起動される 制限 汎用イメージでのみ使用可能 Setup 応答ファイルのカスタマイズはできない クライアント エディションの Windows でのみ利用可能 © 2010 Microsoft Corporation. All rights reserved. Microsoft, Windows, Windows Vista and other product names are or may be registered trademarks and/or trademarks in the U.S. and/or other countries. The information herein is for informational purposes only and represents the current view of Microsoft Corporation as of the date of this presentation. Because Microsoft must respond to changing market conditions, it should not be interpreted to be a commitment on the part of Microsoft, and Microsoft cannot guarantee the accuracy of any information provided after the date of this presentation. MICROSOFT MAKES NO WARRANTIES, EXPRESS, IMPLIED OR STATUTORY, AS TO THE INFORMATION IN THIS PRESENTATION. 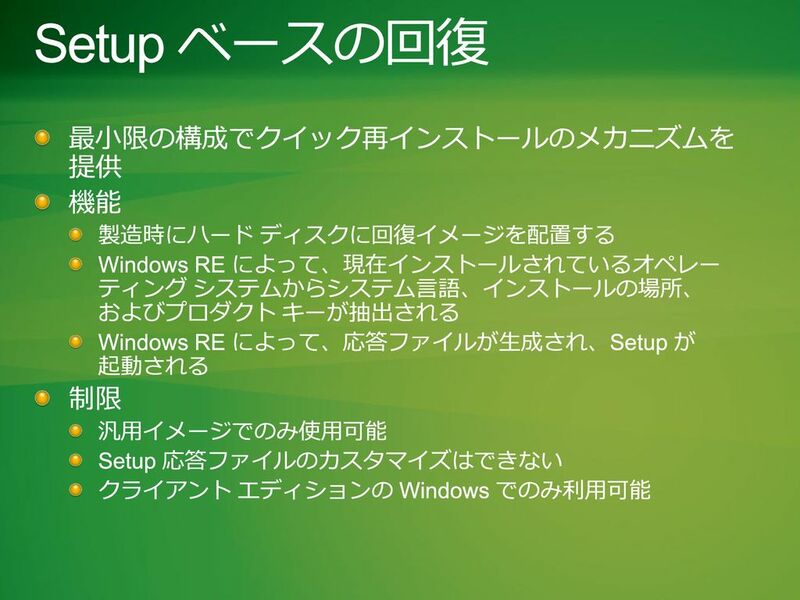 28 Windows Summit 2010 3/1/2017 Setup ベースの回復 Setup ベースの回復を構成すると、Windows RE のツール メニューに新しいオプションが表示され るようになる © 2010 Microsoft Corporation. All rights reserved. Microsoft, Windows, Windows Vista and other product names are or may be registered trademarks and/or trademarks in the U.S. and/or other countries. The information herein is for informational purposes only and represents the current view of Microsoft Corporation as of the date of this presentation. Because Microsoft must respond to changing market conditions, it should not be interpreted to be a commitment on the part of Microsoft, and Microsoft cannot guarantee the accuracy of any information provided after the date of this presentation. MICROSOFT MAKES NO WARRANTIES, EXPRESS, IMPLIED OR STATUTORY, AS TO THE INFORMATION IN THIS PRESENTATION. 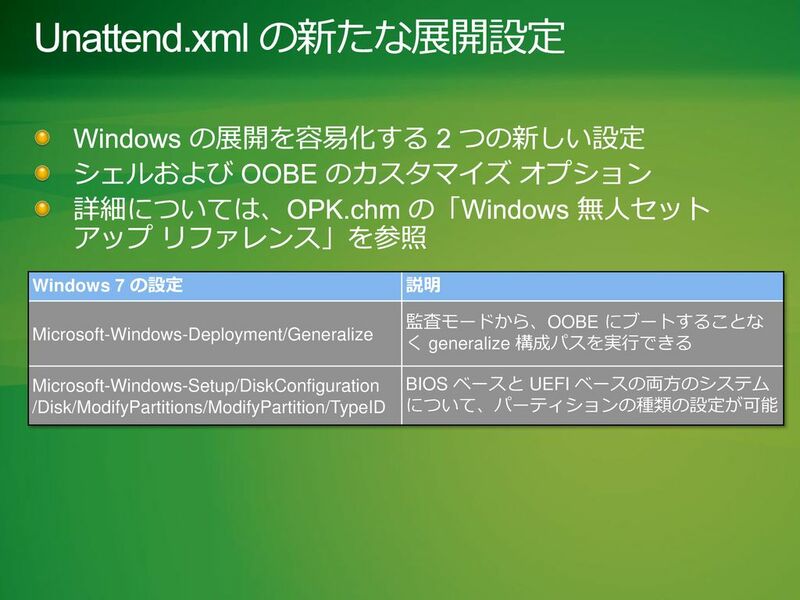 29 Windows Summit 2010 3/1/2017 皆様へのお願い OS 展開用の OPK ツールを入手し、イメージのテストから出荷システムへのイ メージ展開に至るまで、組織全体で使用してください。 Setup と Sysprep を使用して最初のベース OS イメージを完成させ、一般化さ せてください (非汎用イメージを使用したディスクの複製は避ける)。 *.Inf ベースのドライバーを DISM ツールと共に使用してイメージを更新し、 常に最新の状態に保ってください。 マルチキャスト プロトコルおよびサービスを使用する大規模展開には、 Windows Server 2008 R2 付属の Windows 展開サービス ソリューションをイン ストールし、構成してください。 OS イメージの展開、構成、および検証処理には、Windows PE プラットフォー ムを活用してください。 既定の Windows RE をカスタムの診断および回復ツールでカスタマイズしてく ださい。 回復コントロール パネルを使用し、エンドツールエンドの回復操作を実行でき るようにしてください。 下記の Windows Summit 2010 プレゼンテーションを参照してください。 SYS-T163: Windows 7 Image Management and Best Practices (Windows 7 のイメージ管理とベスト プラクティス) このセッションの発表について、評価フォームへの記入をお願いいたします。 © 2010 Microsoft Corporation. All rights reserved. Microsoft, Windows, Windows Vista and other product names are or may be registered trademarks and/or trademarks in the U.S. and/or other countries. The information herein is for informational purposes only and represents the current view of Microsoft Corporation as of the date of this presentation. Because Microsoft must respond to changing market conditions, it should not be interpreted to be a commitment on the part of Microsoft, and Microsoft cannot guarantee the accuracy of any information provided after the date of this presentation. MICROSOFT MAKES NO WARRANTIES, EXPRESS, IMPLIED OR STATUTORY, AS TO THE INFORMATION IN THIS PRESENTATION. 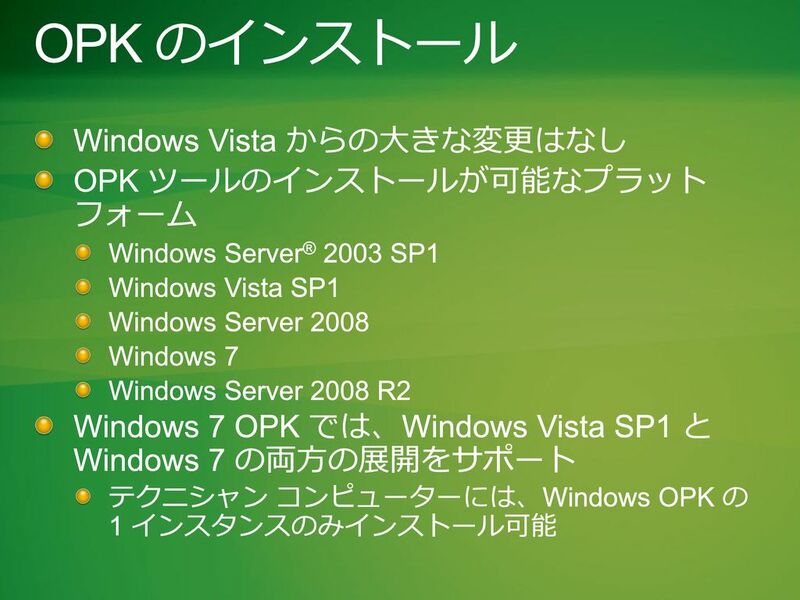 30 Windows Summit 2010 3/1/2017 リソース OEM プレインストール キットについて Windows 7 OEM プレインストール キット (OPK) Windows 7 Build It ビデオおよび資料 Windows 7 チュートリアル: 展開イメージのサービスと管理 AA-4BF DECEDEF7FA5D&displaylang=en Windows 7 の展開に関してよく寄せられる質問 Windows 展開サービス ファースト ステップ ガイド © 2010 Microsoft Corporation. All rights reserved. Microsoft, Windows, Windows Vista and other product names are or may be registered trademarks and/or trademarks in the U.S. and/or other countries. The information herein is for informational purposes only and represents the current view of Microsoft Corporation as of the date of this presentation. Because Microsoft must respond to changing market conditions, it should not be interpreted to be a commitment on the part of Microsoft, and Microsoft cannot guarantee the accuracy of any information provided after the date of this presentation. MICROSOFT MAKES NO WARRANTIES, EXPRESS, IMPLIED OR STATUTORY, AS TO THE INFORMATION IN THIS PRESENTATION. 31 Windows Summit 2010 3/1/2017 © 2010 Microsoft Corporation. All rights reserved. Microsoft, Windows, Windows Vista and other product names are or may be registered trademarks and/or trademarks in the U.S. and/or other countries. The information herein is for informational purposes only and represents the current view of Microsoft Corporation as of the date of this presentation. Because Microsoft must respond to changing market conditions, it should not be interpreted to be a commitment on the part of Microsoft, and Microsoft cannot guarantee the accuracy of any information provided after the date of this presentation. MICROSOFT MAKES NO WARRANTIES, EXPRESS, IMPLIED OR STATUTORY, AS TO THE INFORMATION IN THIS PRESENTATION. © 2010 Microsoft Corporation. All rights reserved. Microsoft, Windows, Windows Vista and other product names are or may be registered trademarks and/or trademarks in the U.S. and/or other countries. The information herein is for informational purposes only and represents the current view of Microsoft Corporation as of the date of this presentation. Because Microsoft must respond to changing market conditions, it should not be interpreted to be a commitment on the part of Microsoft, and Microsoft cannot guarantee the accuracy of any information provided after the date of this presentation. MICROSOFT MAKES NO WARRANTIES, EXPRESS, IMPLIED OR STATUTORY, AS TO THE INFORMATION IN THIS PRESENTATION. 3/22/2017 12:38 PM © 2007 Microsoft Corporation. All rights reserved. Microsoft, Windows, Windows Vista and other product names are or may be registered.